Trade is one of the aspects that Abenomics has designated as critical. So the Bank of Japan has embarked on a radical money-printing program to devalue the yen and make exports more competitive. The principle of a currency war. It would also render imports so expensive that buyers would seek domestic alternatives. The resulting trade surplus would save Japan. In theory. In reality, the opposite is happening. Exports did jump 14.7% in August year over year, the Ministry of Finance reported. But the rest was ugly. Exports were valued in yen, and the yen had lost 20% of its value over the year. So in most categories, export volume actually declined. But Imports jumped 16%, from a higher base, and the trade deficit soared 25% to ¥960.3 billion ($9.6 billion). Analysts were shocked. It was the worst August trade deficit ever. It was the 14th month in a row of trade deficits, matching the longest such spell of 1979-1980. It was 27% higher than the trade deficit of August 2012. By comparison, in August 2010, Japan had a surplus of ¥63.8 billion; in August 2009, a surplus of ¥165 billion; in August 2007, a surplus of ¥784.6 billion! For the eight month period, the trade deficit hit a record of ¥6.8 trillion, up 66% from the same period in 2012, and up 332% from 2011. During that period in 2010, Japan had a surplus of ¥4.2 trillion! Japan’s trade fiasco is on a steep downward slope. August was the worst August ever, July the worst July ever, June the worst June ever…. There’s no discernible turning point on the horizon. Japan and China have been rattling with their sabers as they trip over island issues and historical entanglements. But China is Japan’s largest trading partner: in August, 25% of Japan’s exports went to China, and 21% of its imports came from there. As a large portion of exports to China are transshipped through Hong Kong, we have to look at China and Hong Kong as one. Exports to both combined rose 16.8% to ¥1.45 trillion, and combined imports rose 17.7% to ¥1.43 trillion, for a small trade surplus of ¥11.8 billion ($118 million). A far cry from the past when Japan used to be one of the few major countries to have had trade surpluses with China – in August 2007, for example, of ¥226 billion. On the positive side, exports to Europe recovered from the abysmal debt-crisis levels last year and shaved the trade deficit down to ¥ 97.7 billion. 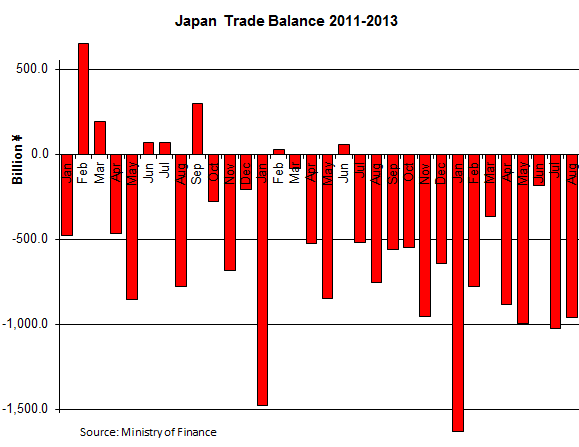 And Japan’s perennial trade surplus with the US, its second largest trading partner, soared 29.3% to ¥495 billion. Japan’s trade debacle has been brushed off as temporary. If Japan could just start all of its rickety nuclear powerplants – whether or not they sit on top of active fault lines, and whether or not they’ve been involved in prior safety scandals – it would have to buy as much overpriced LNG and petroleum with its demolished yen to feed its fossil-fuel powerplants that fill the hole left behind by the nuclear reactors. And its trade deficit would go away in one fell swoop. LNG (42% of the current power generation mix) and petroleum (18% of the power generation mix) are factors. Imports of LNG rose 7.2% and of petroleum 27.2% – due to price increases and yen devaluation, not volume increases! And imports of all categories jumped. Among them: manufactured goods (such as iron and steel products) by 16.2%, machinery by 21.7%; its sub-category “computers” by 18.5%. Electrical machinery, third largest category, soared 21.9% and its largest sub-category “semiconductors” by 44.1%. Transportation equipment was up 22.7%. “Other,” the second largest category, was up 12.4%, its subcategories “scientific instruments” 12.4%, clothing 21.4%, and furniture 20.4%. A dismal import picture. It detailed the systematic deindustrialization of Japan, which has been going on for years, though it has lagged behind that of the US. In recent years, in particular since the earthquake of 2011, the process has gained momentum. Japan Inc. is offshoring production to China and other countries where wages are lower, though they’ve been rising. But companies have another motivation: being closer to their customers in the largest market on earth. 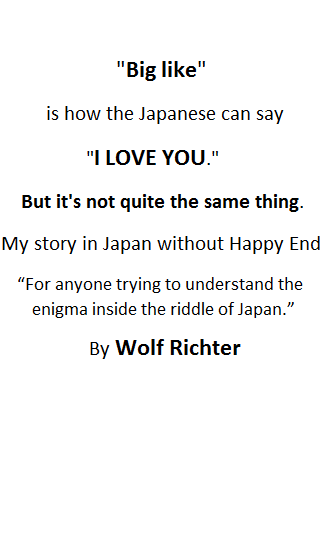 A devalued yen won’t change that. But ironically, it incentivizes Japan Inc. to produce goods overseas that are sold overseas. Revenues and profits are translated into the weaker yen, with a glorious impact on the bottom line – as recent earnings reports have shown. However, these paper profits exist only on yen-denominated financial statements. Most of the actual profits are reinvested overseas and never make it back to Japan. This is the sort of thing that Abenomics excels at. ← Colorado’s Fracking Industry At Threat From The Floods?